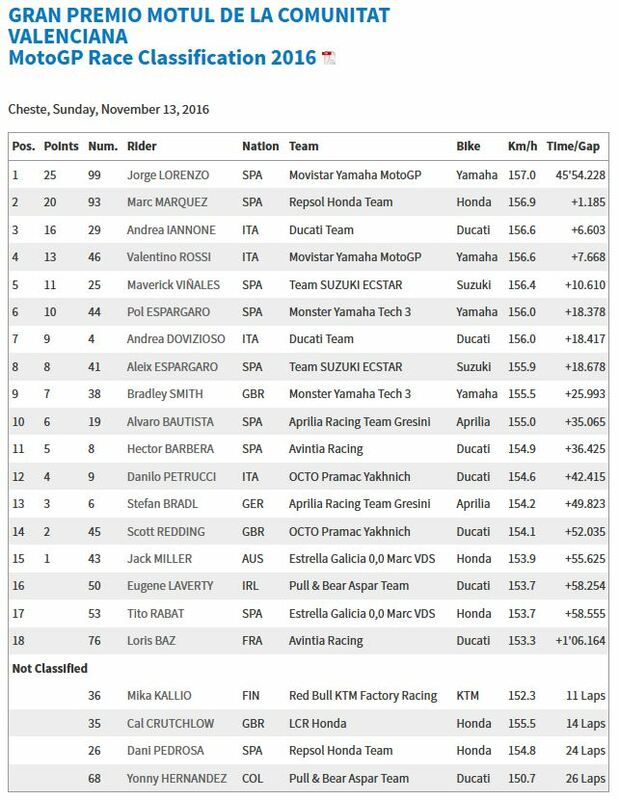 Jorge Lorenzo “Por Fuera” made a Flag-to-Flag race in pole; with a brilliant menacing Marquezz coming back as a rocket in the ast laps. Speaking of… Rockets; the power of the Ducati had the better over Valentino Rossi with Andrea Iannone P3. After getting past Viñales, Rossi and Iannone fought it out at the head of the second group as the number 99 began to disappear into the distance, with Marquez and the number 25 in close company. 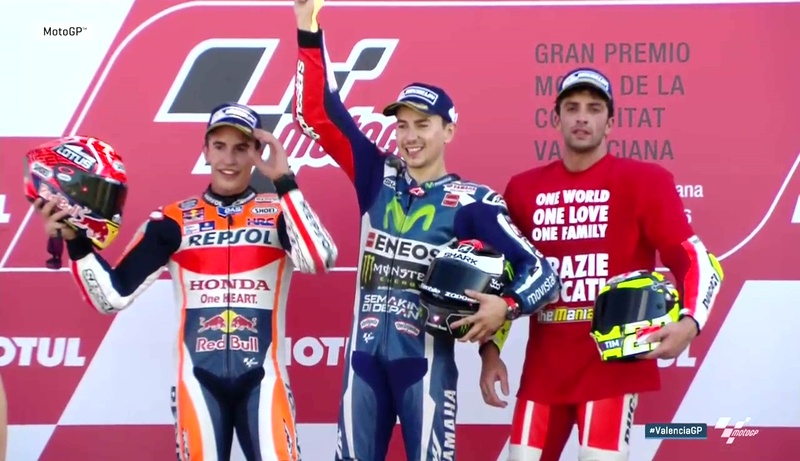 As Rossi got to the head of the chasers, Iannone hit back again – and so began Round 2. It was the ‘Maniac’ who initially came out on top, before Marquez saw his shot and got through – gapping the fight to start a charge after Lorenzo at the front, eventually cutting more than three seconds off the number 99’s lead. The podium decider was left to a brutal, classic battle between Iannone and Rossi – with the rider from Tavullia seeming to have got the better of his younger compatriot, until Iannone hit back with an aggressive move that also gave him a gap he was able to hold onto over the line. Viñales completed his final weekend with Suzuki in P5. Dovizioso eventually dropped slightly back from the front group into the clutches of Aleix Espargaro (Team Suzuki Ecstar) and brother Pol (Monster Yamaha Tech 3) to fight for P6 after grip issues – with the younger brother Pol finally taking the honours over the line in a photo-finish against Dovizioso, and Aleix seeing the flag in eighth. Returning Repsol Honda Team rider Dani Pedrosa crashed out after an impressive weekend despite a recent collarbone break, and wildcard Mika Kallio, debuting the new KTM RC16, was sadly unable to see the flag after technical trouble – but the Austrian factory now head into the 2017 pre-season with vital information after lining up for the first time. After a history-making 2016, MotoGP will return in pre-season testing on Tuesday – with Lorenzo in red at Ducati as the pack shuffles and prepares its hand for another incredible season of motorcycle racing.